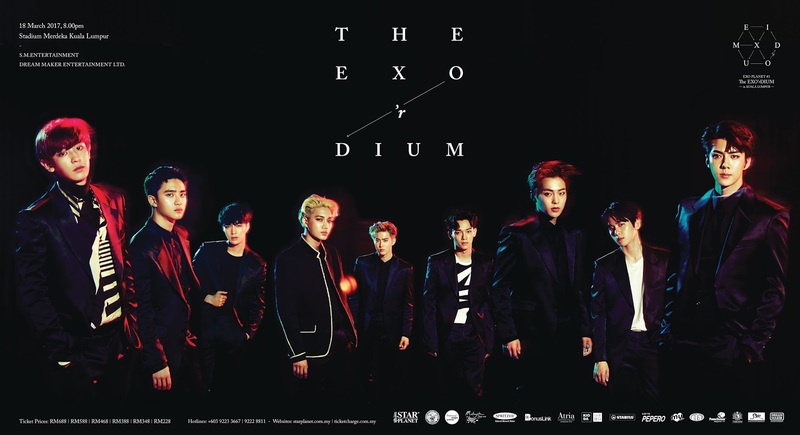 Kuala Lumpur, February 2017 – All Kpop fans, get ready as the hottest South Korea boy group EXO officially kicked off their brand new tour “EXO PLANET #3 The EXO’rDIUM” with 6 dates in Seoul last July. They set a new record as the first K-pop group in history to have the longest solo concert ever run, at Seoul’s Olympic Gymnastics Arena, with over 84,000 spectators. The Return of the Best-Selling Korean Group EXO to KL in March for 3rd Tour! This new tour marked EXO’s third solo concert tour since their debut in 2012, and the concert title, inspired by the Latin word “exordium” which means “beginning,” suggests that fans can expect to see a more mature and improved side of EXO. They have proven their immense popularity as the tickets at the touring cities such as Bangkok, Taipei, Hong Kong and more were fully grabbed up within minutes! Organized by Star Planet, supported by Malaysia Major Events, EXO is set to return with EXO PLANET #3 The EXO’RDIUM in Kuala Lumpur, striving to thrill fans with a 1-night concert at Stadium Merdeka Kuala Lumpur on March 18th, 2017 at 8p.m. The group hit it big during their last KL concert, successfully amazed a crowd of over 15,000 people. The upcoming gig, said to be one of the biggest concerts of the year with an extraordinary production, is anticipated to attract an even greater turnout. EXO debuted in 2012 and rose to fame with the release of their million seller album XOXO in 2013. The group has since obtained many big achievements including winning a large number of awards to their winning streak, nominated as #1 Best K-Pop Song by American Billboard in 2013, the biggest influence in Korea by Forbes Korea Power Celebrity in 2014 and 2015 for two consecutive years, among others. Their 2nd studio album EXODUS made EXO the highest-charting Korean male act on the Billboard 200 in 2015. EXO becomes ‘triple million-seller’ when their second studio album on 2015 and third studio album on 2016 both recorded platinum by selling more than 1 million copies, along with winning #1 awards 4 years in a row on multiple year-ending award ceremonies. The group rewrote history and created a big wave in the music scene. Tickets are priced at RM688, RM588, RM468, RM388, RM348 and RM228 *subject to RM4 processing fee. For more concert information, please visit www.starplanet.com.my or www.ticketcharge.com.my or call +603 9223 3667 / 9222 8811.